About Grey Muzzle Redesign, yes! Now what? About Grey Muzzle Partners Found! 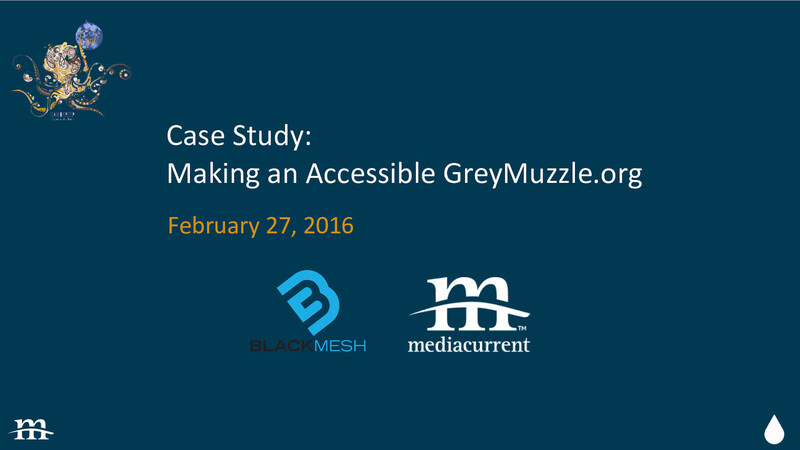 View Case Study: Making an Accessible GreyMuzzle.org on Notist. In October, 2015, a team from Mediacurrent worked on an accessibility project for the Knowbility Open Air hackathon. See Part 1 for background information. We built the Grey Muzzle Organization website to be a shining example of an accessible Drupal site. Following are many of the things we did to accomplish this.